This weekend coming I'm heading to my second music festival of the summer. Once again it's on the Isle of Wight, which is a location that keeps cropping up here on Diary of a Ledger but I'm aware that many of my readers may never have been, know where it is, or may just have vague recollections from a family holiday there when they were very young. Firstly it's where I was born and grew up. And let me just say that in terms of a location to bring up a couple of kids my parents could not have chosen a better place. They had some first hand experience though, they were also both born and raised on the Island. It is not a big place by any stretch of the imagination, diamond shaped and roughly 23 miles east to west and 13 miles north to south. (About 147 square miles fact fans.) It's located just off of the south coast of England directly below Southampton on the mainland where I currently reside. The size of the place leads to what The Giant refers to as an 'Island mentality'. Basically this means that any journey that lasts longer than twenty minutes is 'a long way' and you get incredibly used to everyone knowing everything about you. The population is around a quarter of a million and you can't go anywhere without seeing someone you know. This is invariably a good thing, but you do have to get used to not being able to do anything without everyone knowing about it the following day. That can lead to an interesting times as a teenager. People describe the Island as like stepping back in time. It can still feel like that in some places but compared to twenty years ago it's moved forward enormously. The Festivals have played a part in that despite many of the locals having reservations. They've made the Island cool again, there is nothing quite like walking through Newport (the Islands capital) on a Festival day and just seeing the town alive with people. It makes me proud to be an Islander to see it like that. It does have a uniqueness to it that I've not seen anywhere else, a character all of its own and for me personally it's a place full of bitter sweet memories. The journey from the ferry port in Cowes to the family home in Newport takes me past the place where my father passed away but also past some of the locations of the happiest days of my life. In such a small place you can't move without a memory of something being stirred. It's beautiful too. There is some truly dramatic coast line on the south of the Island that rivals the cliffs of Dover, if not in scale then certainly in their beauty. It's hilly too, there are downs reaching from the middle of the Island to the southern point. You can stand on them and see the mainland on one side separated by the Solent and the English Channel on the other. There are castles, Victorian Royal Houses and loads of manor houses to explore. I love the west of the Island, West Wight (I kid you not) that has largely remained unspoilt by tourism. The walk across Tennyson Down from Freshwater to Alumn Bay is an amazing journey over heathland perched on top of huge cliffs. 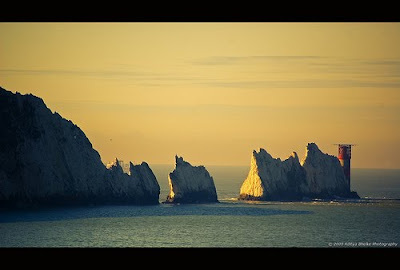 And the view of the Needles and lighthouse when you get to the end of that journey is stunning. It's a clichéd image of course, over used to promote the Island, but seen with your own eyes, it is still breathtaking. The Island gets some stick. It's not all peachy. Employment is hard to come by in a place so driven by the tourist season. The winter can be pretty bleak, it's really in the summer that the Isle of Wight comes to life, and the journey across the Solent can be an interesting one, it can get pretty rough out there at times. But that's part of the appeal for me anyway. There's nothing quite like getting on a boat to go home. That stretch of water makes such a difference, seriously, there's a different pace to life on the Island. It's a family place for me too. My mum and step dad live in Newport and my sister and her lovely family moved back a few years ago too. So going over is always a treat for me. Christmas is a joy with my sisters kids around and that journey over on Xmas Eve is still the best boat trip every year. I often say that I love it there, but I couldn't live there any more. I love city life and enjoy the anonymity that can bring. But the Island remains 'home' and always will. There's no where else quite like it. Bring on next weekend. I've loved there (at least three time), buried there (my father), married there (I got divorced else ware), made a fool of myself there (too many times to mention), learnt harsh lessons there (maybe one day I'll share) and I grew up there (a bit anyway). The Isle of Wight folks. Odd little place yes. Ace little place though. You can knock the Island but you'll never knock the Island out of me. I'm a Caulk head through and through. Lots of time it is a good idea to live somewhere else to hide from those 'there's' LOL.